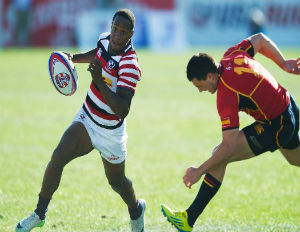 Carlin Isles has been deemed the ‘fastest man in rugby’ by several sources including CNN. The USA rugby star was lured by the NFL Detroit Lions in 2013. But shortly after signing a practice contract with the team, Isles left football and returned to rugby. As a member of the U.S. national rugby sevens team, Isles competes internationally representing the U.S.
USA Today Sports reported in December that “Carlin Isles remains one of the best things to watch in all of sports,â€ after Isles wowed spectators in Dubai for the HSBC Sevens World Series. “His speed was in full effect,â€ said USA Today. As Isles looks forward to the 2016 Summer Olympics, he speaks with TSL Sports Talk about what attracts him so to a sport that is not traditionally played by African Americans. Watch the podcast interview below.